Macmillan, M. (2014). Gage, Phineas. In R. Daroff & M.J. Aminoff (Eds. ), Encyclopedia of the neurological Sciences. (2nd ed.). [Online]. Oxford: Elsevier Science & Technology. Available from: https://search.credoreference.com/content/topic/gage_phineas_1823_1860 [Accessed 25 April 2019]. Macmillan, M. "Gage, Phineas." Encyclopedia of the Neurological Sciences, edited by Robert Daroff, and Michael J. Aminoff, Elsevier Science & Technology, 2nd edition, 2014. Credo Reference, https://search.credoreference.com/content/topic/gage_phineas_1823_1860. Accessed 25 Apr. 2019. Phineas Gage (1823–60) was the first person in whom a traumatic brain injury is known to have caused a personality change. 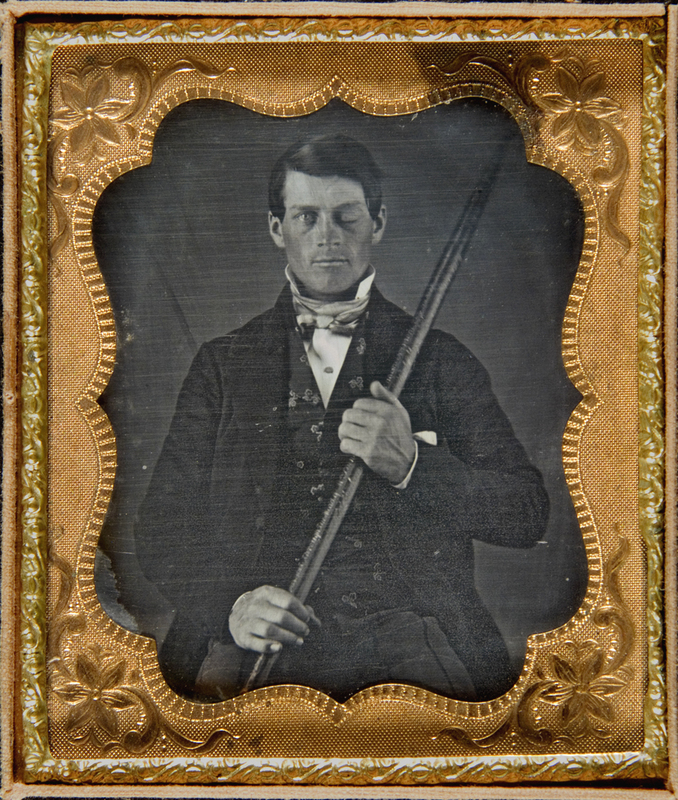 Gage was a railroad foreman who sustained a frontal brain injury when an explosion blew his tamping iron, a rod-shaped bar, completely through his head in September 1848. What is written about the change in Gage's personality is generally inaccurate, picturing him as a permanent psychopathic idler. Recent reconsideration indicates that he made a surprisingly good psychosocial adaptation, or social recovery, through a process consistent with the rehabilitation methods later pioneered by Soviet psychologist Aleksandr Romanovich Luria (1902–77). Phineas Gage (1823–60) was the first person in whom a traumatic brain injury is known to have caused a personality change. What is written about the change is generally inaccurate, picturing him as a permanent psychopathic idler. Recent reconsideration indicates that he made a surprisingly good psychosocial adaptation, or social recovery, through a process consistent with the rehabilitation methods pioneered by the Soviet psychologist Aleksandr Romanovich Luria (1902–77). Before his accident, Gage was temperate, persistent in achieving his plans, a shrewd smart businessman, and the most efficient foreman employed by the Rutland and Burlington Railroad. He changed after an explosion blew his tamping iron, a rod-shaped bar, completely through his head in September 1848. The iron entered under his left cheek bone and passed out at the top of his head. After a stormy recovery, skilful treatment by Dr. John Martyn Harlow (1819–1907) had him home in Lebanon, New Hampshire, about 3 months later. Gage was soon well enough to do simple farm work and by late 1849 he began to support himself. First he exhibited himself in Barnum's Museum in New York City and then demonstrated himself in a lecture tour of New England. Later, he worked as a stableman and possibly a coach driver in New Hampshire and after about 2 years he went to Chile as a stagecoach driver. In 1859, he became ill and joined his family in San Francisco where he recovered. He resumed work but died a few months later in 1860, in status epilepticus. Available information concerning Gage's injury-induced personality change is inconsistent with the common view of Gage as a boastful, brawling, foul-mouthed, dishonest useless drifter, unable to hold down a job, who died penniless in an institution. Harlow, who is the major source of information, described Gage's personality changes in 1868: showing little deference to others, abandoning his plans as soon as formulating them, and not only becoming fitful, irreverent, grossly profane, impatient, and obstinate, but also capricious and vacillating. Harlow concluded that the balance between Gage's intellectual faculties and animal propensities was destroyed. The changes Harlow reported have mostly been thought of as permanent. However, Harlow's negative description is about Gage within 2–3 years of the accident, whereas more positive information regarding late functioning is available from his family's recollections and a medical report about him in Chile. The organized routine of Gage's stagecoach work may have allowed him to regulate his behavior and so achieve the reasonable psychosocial adaptation, or social recovery, his later history indicates. That adaptation is consistent with the rehabilitation methods pioneered later by Luria. The lack of a postmortem examination and limited information about Gage's behavior has hampered attempts at correlating his injury with it. From their model of Gage's skull and brain, Hannah Damasio and colleagues concluded in 1994 that both left and right prefrontal cortices were damaged. A decade later, computerized tomography of Gage's skull by Peter Ratiu and colleagues reproduced the skull damage exactly, including the fracture line running from his cheek to the back of his head: this demonstrated that the damage was only to the left frontal area, as Harlow had said. A recently identified daguerreotype shows him disfigured but facing the world confidently and proudly (Figure 1). Figure 1 Laterally reversed image of the daguerreotype of Phineas Gage discovered by Jack and Beverly Wilgus and used with their permission. Bigelow, H.J. Dr. Harlow's case of recovery from the passage of an iron bar through the head American Journal of the Medical Sciences 20 1850 13-22 Facsimile in Macmillan, 2000, Appendix A.
Damasio, H; Grabowski, T; Frank, R; Galaburda, AM; Damasio, AR (1994) The return of Phineas Gage: Clues about the brain from the skull of a famous patient. Science 264: 1102-1105. [Erratum Science 1994, 265, 1159]. Harlow, J.M. Passage of an iron rod through the head Boston Medical and Surgical Journal 39 1848 389-393 Facsimile in Macmillan, 2000, Appendix A.
Harlow, J.M. Recovery from the passage of an iron bar through the head Publications of the Massachusetts Medical Society 2 1868 327-347 Facsimile in Macmillan, 2000, Appendix A.
Kotowicz, Z. The strange case of Phineas Gage History of the Human Sciences 20 2007 115-131. Macmillan, M. An Odd Kind of Fame: Stories of Phineas Gage 2000 MIT Press Cambridge MA. Macmillan, M. Phineas Gage: Unravelling the myth Psychologist 21 2008 836-839. M. Macmillan; M.L. Lena Rehabilitating Phineas Gage Neuropsychological Rehabilitation 20 2010 641-658. P. Ratiu; I.F. Talos The tale of Phineas Gage, digitally remastered New England Journal of Medicine 351 2004 e21. J. Wilgus; B. Wilgus Face to face with Phineas Gage Journal of the History of the Neurosciences 18 2009 340-345.
http://www.brightbytes.com/phineasgage-The Daguerreotype of Phineas Gage. http://www.uakron.edu/gage/- University of Akron - The Phineas Gage Information Page.